How Do I Get Off of an Unwanted Email Distribution List? - Ask Leo! If you actually subscribed to the email list yourself — by filling out a form, or joining an organization that put you on it, or by some other explicit step you can recall — clicking the “unsubscribe” link is exactly the right thing to do. 99% of the time you’ll be removed from the mailing list without any hassle. Naturally, there’s that other 1% where things don’t go as promised. I give lists a couple of days to remove me. Some lists tell you “It may take up to 48 hours for you to be removed.” There should be no need — unsubscribing should be instantaneous — but I’ve seen lists claim it’ll take up to a week. I may not give them a week, but I’ll usually give them a couple of days. If you continue to get emails after that, it’s time to call it what it has become: spam. If you’ve been placed on a list you didn’t ask to be on, then by definition it’s spam. NEVER click an “unsubscribe” link in spam. As you’ve seen, you’ll just get more spam. Clicking on the unsubscribe link in spam tells spammers that you actually read email sent to this email address, and thus you become a bigger target. The best way to deal with spam is simple: if it appears in your inbox, mark it as spam every time it arrives. Depending on your email program, eventually it will learn that email like this is spam, and should either be rejected outright or delivered into your spam folder, where you need not look at it. If you subscribed, try to unsubscribe first. “This is spam” should not be your first choice when you want to stop receiving something you asked for. Give the provider the opportunity to handle things the proper way. Only when they fail to remove you should you then mark it as spam. The issue is simply that when you mark something as spam, it makes it less likely that others who actually want the mail will get it. Spam detection is complex, but one of the signals used is that “this is spam” button. If enough people hit it, the mail will be more likely to be filtered as spam for everyone. Clicking “this is spam” on legitimate email unjustly punishes the folks who play by the rules. 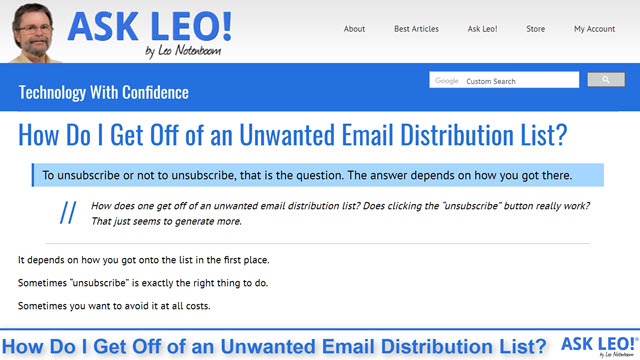 Originally answered on Quora: How does one get off of an unwanted email distribution list? 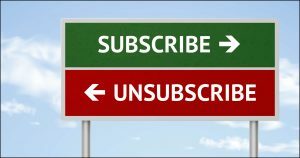 Does clicking the “unsubscribe” button really work? That just seems to generate more. Someone Is Signing Me Up for Newsletters I Don’t Want — What Can I Do? - If someone, even someone you may know, is targeting you with spam - it's still spam. We'll treat it as such. « Previous post: Email I Was Composing has Disappeared. Can I Get it Back? It is amazing how often I have seen people post (to a list that only goes out by explicit request to get it) asking how to unsubscribe when it is posted at the bottom of every message. I have even seen some rude name calling and saying that they would report the list if they are not taken off. Probably because people forget that they subscribed and then see dumb articles like this one telling them not to use the unsubscribe button *unless* they subscribed. If I unsubscribe and get a message that says “It may take up to 48 hours (or any time period) for you to be removed.” and I get any more emails from them, I’ll mark any new emails from them as spam. I don’t see that as punishing the innocent. It’s no longer requested and therefore spam. They should have done better. Nonsense. First, as to the old “you’ll get more spam” chestnut, there’s zero evidence to support the claim. In fact, when you think about it logically, the claim doesn’t even make sense. Second, legitimate companies buy, sell and rent email lists all the time. The easiest and more sensible way to get them to stop emailing you is to unsubscribe. Unsolicited email, by definition, is spam. If a company buys an email distribution list and send out emails to that list, it’s spam and illegal in many countries including the US. Many spammers do include an unsubscribe link to let them know they have a live email address. “Unsolicited email, by definition, is spam. If a company buys an email distribution list and send out emails to that list, it’s spam and illegal in many countries including the US.” – It would behoove you do a modicum of research prior to making such comments. The US CAN-SPAM Act absolutely permits unsolicited messages to be sent so long as it meets certain requirements – for example, that the message includes an unsubscribe link. That’s so that people can, you know, use it to unsubscribe. “Many spammers do include an unsubscribe link to let them know they have a live email address.” – Ha! Do you seriously believe that spammers – actual spammers; not legit companies – who send millions of spams per days using comprised computers that have been coopted into botnets are monitoring unsubscribe requests to conform validity of addresses? Sorry, but it’s an absurd suggestion. Do you have a single shred of evidence to support this ridiculous claim? They wouldn’t need to monitor those manually. They could easily have a program handle those. Oh, boy. There have been an absolutely massive number of email addresses leaked as a result of data breaches in recent years with more than 1 billion being leaked last year alone. Guess what? Every one of those email addresses can now be bought in bulk for dirt cheap or traded for free (if you’ve got something to trade, that is). Random Gmail addresses will cost you $1 per 1 million addresses while a curated list of country-specific and/or industry-specific addresses will cost you a bit more. Bottom line: spammers don’t need to validate email addresses because lists of valid email addresses are already available and cost next to nothing. 2. Using a bot herder who’ve you anonymously paid in coin means you’re less likely to be caught by the authorities. 1. If you want to stop receiving emails, whether solicited or unsolicited, from a legitimate company, use the unsubscribe button. That’s why it’s there. 2. If you’ve received spam selling Viagra or something similar, delete it and get on with your day. FrankC, you must be a bad lawyer for some spammer. You say “If you’ve received spam selling Viagra or something similar, delete it and get on with your day”. So, as per your advice, why wouldn’t you click the unsubscribe button before you go on with your day? And why are you calling it a “spam”? If the definition of “spam” is not unwanted mail, then that presumes you wanted the Viagra email. And didn’t you say there is no such thing as spam because there are legitimate companies sending out solicitations? Are you now calling Viagra illegitimate? Also, please tell us the name of your “legitimacy filter” you use so we can all benefit from it. Thank you. But seriously, try to relax. I keep getting spam that no matter how many times I mark it as such, it just keeps coming. Another odd quirk is that all of it has the same FROM and TO names. When I look at the expanded TO name they all end in .us or .gdn. How do I get these two extensions recognized by the spam filter. Depends on your email provider. Most email providers will have a configurable spam filter which allows you to block certain domains or specific email addresses. For example, if you use Gmail, Google “gmail spam filter settings” and you should see instructions on how to configure the filter. With my email provider I can block all emails from, say, *@*.gdn (that means any email from the .gdn domain). Good old MicroSquish’s newest E-mail program for Windows 10 doesn’t have a SPAM folder or any way to send unwanted junk-mail to Spam! Thank you, you stupid guys! The Windows 10 Mail App has a junk folder and trainable spam filter.